This smooth stadium cup is similar to the 22 oz fluted cup but in a glossy smooth finish without the ribbed sides. The smooth design makes it great to show off your logo with the multiple color options. No matter the event, you will be able to match the occasion with your custom stadium cup while you show off your image. 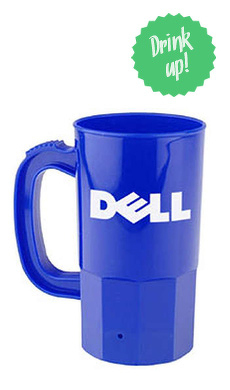 This is a very affordable cup that keeps money in your pocket while giving you reusable cups that are durable and promote your company at the same time. It is great for games, BBQs and any other event you might be attending. Leave a lasting impressions on clients with this great design. Two sided printing with one color imprint. Also available in 16 oz and Lids and straws are available to make your experience with this cup even better. We think the cups we purchased look awesome. Love the color and the layout of the graphics. Service was excellent. The development of the artwork could not have been easier. Order was delivered quickly with no problems. We are looking forward to the first football game of the season. Redwater Band Boosters. Extremely fast, perfect, and amazing price. I couldn't be happier. Within 24 hours of sumbitting I received artwork template and less than a week after approved I received my 300 cups. Great company. Customer service, product quality and price was exceptional. Very satisfied with purchase.